Who is This Sketchbook For? Before we dive in on the sketchbook, let's talk briefly about Strathmore as company. Strathmore have a long history of quality paper and art journals. Originating in Massachusetts, in 1892, it produced the first art papers in 1899. The company have had almost 120 years to perfect their products, meaning they had time to get the recipe right. In a time when many companies fail to go the distance, Strathmore continues to go from strength to strength. Even the iconic Norman Rockwell could only say positives about their paper - now that means something! 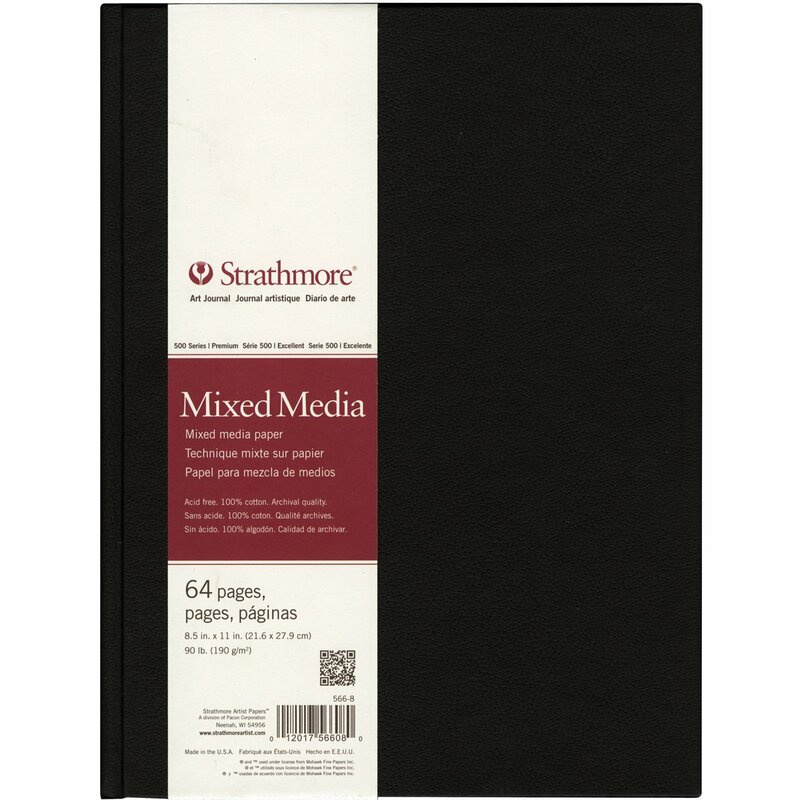 The Strathmore 566-8 500 Series Hardbound Mixed Media Art Journal is a popular choice for many serious artists everywhere. Manufactured in the United States, this sketchbook is easily obtained online. While this is not the cheapest sketchbook that you can buy, but given its quality - this is one book guaranteed to keep your art work looking the very best for many years to come. This high quality sketchbook is definitely a professional grade sketchbook, if you are a budding artist, you might find a better value with other sketchbooks. This sketchbook is very versatile (as expected for a mixed media sketchbook), various art medium such as gouache, acrylic, pen and ink, graphite, coloured pencils, markers, pastels, collage and watercolours will work well with this sketchbook. Please watch the video below as it gives you some fine examples of how you might want to use the sketchbook. The paper is where this sketchbook shines, the paper is 100% cotton fibre - which honestly is quite hard to find these days. This high cotton content can only one thing: a high quality sketchbook suited for professional and experienced artists. The pages are also acid-free and lignin-free. This is of particular benefit to the serious artist as it allows any art work to be able to last for many years, without the worry of deterioration or fading. Containing a useful 68 pages of 300 gsm, which is a bit thicker than standard sketchbook - you’ll obtain the perfect artist’s finish each and every time. The paper has been internally sized for wet media and it has a vellum finish for drawing techniques, which will suit artist that wants to experiment with wet media such as watercolor. Another point of difference is in the beautiful Smyth-sewn binding. Also known as section sewn, this way of holding pages together enables them to lay much flatter and keep your art work in prime condition. This sketchbook really presents itself as a tough, hard-wearing book. It comes with a hardcover, created in a gorgeous leather look, the lightly textured nut-brown cover with a classy matte finish. It would look great in anybody’s art studio, on a bookshelf or tucked stylishly under the peripatetic creative’s arm. It has been observed that heavy watercolour makes the pages in the sketchbook susceptible to wrinkling. Not a deal breaker, we can simply combat this by a gentle iron when the art piece is dry, thus eliminating the creases and maintaining the integrity of the art piece. Other considerations you may like to think about are what types of markers you use on the pages. Depending on ink saturation, there may be some bleeding issue. Again do remember that this sketchbook has 300 gsm paper which is only a tad thicker than standard sketchbook. So while this sketchbook can handle "some" level of wet media, but don't expect a heavy usage of wet media on this (find out more about all things about sketchbook paper weight). Canson XL Series Mix Media Pad is another popular choice. It is a great value sketchbook, with a paper surface tha rivals more expensive sketchbooks such as Strathmore. There is a plethora of other art sketchbooks available to purchase, with varying degrees of quality and price. It pays to read our reviews and do your own research to see which one suits your needs. We recommend to also read our article on "Best Sketchbooks of 2019: Complete Reviews with Comparison". There are many sketchbooks available on the market today, ranging in quality and prices. If you care about the quality and endurance of your creative talents, then it’s well worth doing your research to find the appropriate sketchbook for you. The Strathmore 566-8 500 Series Hardbound Mixed Media Art Journal, is an excellent choice for those who appreciate a quality product, that’s befitting of an imaginative artist. When you consider the quality of the paper, the visual aesthetic, and the size, it’s plethora of positive qualities make it a brilliant choice for everyone.